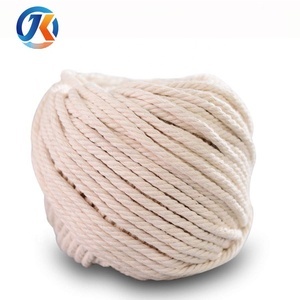 This cotton rope is soft, very comfortable to handle and the least likely rope to cause rope burns. Q: How long is your delivery time9 A: Generally it is 5-10 days if the goods are in stock. 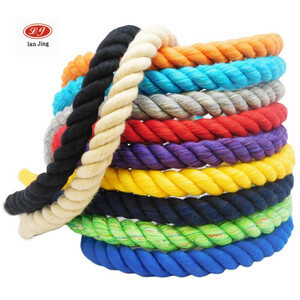 cn Contact with me If you require any further information for cotton ropes, feel free to contact me. 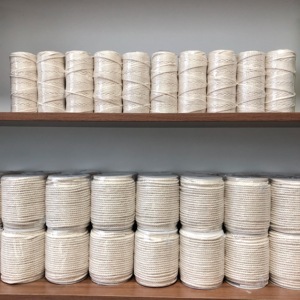 Wholesale Braided cotton rope macrame cord for wall hanging Product features: 1)Natural cotton macrame cord, any size can be customized. 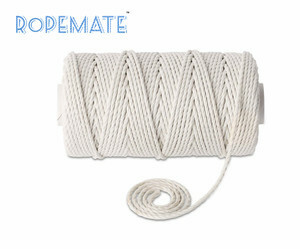 Product Wholesale 4mm cotton macrame cord for wall hanging Material: 100% cotton Shape Spool Technics: Braided Feature: Eco-Friendly, High technology Usage Bags, Garment, Home Textile, Shoes Color: White, belge white Size can be customized MOQ: 1000m Package 36pcs/ctn, opp bag Lead time 7-10 days after placing the order. 24-hour service Salient is built with a responsive layout, which means it automatically. Type Cotton rope Model number 40# Use Furniture ,pillow Material 100%cotton Color White Technics Twisted Specification Diameter:3mm-10mm Unit KG Quantity of each carton Customized Place of origin China Brand name Rongsun Production workshop Customer Packaging & Shipping Delivery We choose best delivery way with reasonable price and effective delivery time, including express, air transport, shipping way. 1. Sample&rsquo;s lead time:4-7days 2. Mass productions&rsquo;s lead time: about 10 days Payment T/T 30% as deposit to start production,the balance should be paid before loading. Why choose us9 1) Good quality 2) Competitive price 3) Variety models and specifications 4) Short delivery time 20days 5) The most professional OEM manufacturer Certificate 1) China National Business Credit System Member 2) China Credit Example Certificate 3) Integrity merchant of Asia international materials trading center 4) Guangdong furniture chamber of commerce raw and auxiliary materials professional committee member Services 1) Most and watmly welcome to visit our factory 2) All goods will be checked by our QC or your QC before delivery 3) We have appointed man to answer your questions on Alibaba in 12 hours 4) Welcome to provide the sample for custom Contact us Name Jason zhang Email 3413173091( Mobile +86-18928625682 Whatsapp&Wechat +86-RS18928625682 QQ 3413173091 Website Address no 10 Yuanman Rode,Suxi Industrial Distruct,G325,Longjiang,Foshan,Guangdong,China Any inquiry,we will get back to you within 24 hours. Guangzhou Chirui Electronic Technology Co., Ltd.
You can pay 30% deposit when order, and the balance after i show you pictures of goods before delivery. (if amount is not large , will be advice pay by once ,because the handle fee is high for a small amount . Professional manufacturer of kinds bags ,cords , tassels, ribbon , bows and other gifts package accessories . 100% Cotton cor d 1. Made of 100% cotton 2. Eco-Friendly 3. Garment accessories 4. Custormer's requirements are available 5. Sample available product features: 1) Composed of 100% cotton in material. 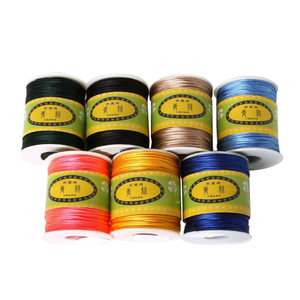 3) Style:woven 4) Products widely be used in garment accessory,bags,belts,gifts,Handicraft,Tourism Products and so on. 5) Delivery time:it depends on the order details,usually about 15 days after confirming all order details and receiving the advance payment by T/T or West Union. Natural differences in driftwood and the handmade process ensure that no two pieces that I make are identical. If I am not happy with the aesthetics or the durability of a piece it will not leave the studio. we manufacturer best quality macrame products in the world as we have now skilled person who manufacture them with quality skill and time . Wholesale Macrame Cord has been the major product in the Cords market over the past year, and it was very popular in United States,Australia,India,Wales and Canada; As shown in the distribution chart, market shares of these countries are folowing: [ US:34.42%, AU:31.08%, IN:10.84%, GB:6.69%, CA:5.10%, other:11.87%]. What's the trends of Wholesale Macrame Cord product's market in 2018 (Dec 2016 to Jan 2019)?we have studied one years data on online sales, global shipping, search, sourcing and requirements of following products Webbing.